Camp Green Rush is a cannabis event like no other! 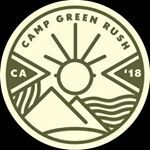 A 4-day, 3-night luxury camping retreat, Camp Green Rush brings industry professionals, patients, and enthusiasts together on a stunning 82-acre campground just outside Los Angeles. There will be expert panels, yoga, nature hikes, celebrity comedy and music shows, summer camp activities, gourmet food, and so much more! You'll learn, make lasting memories, and build a valuable network all while experiencing nature and cannabis at its finest.